Newsflash: Stephen Harper Not Made of Teflon After All! Given the current Senate scandal I felt compelled to drag this image I created back in May, 2008 back onto the blog. 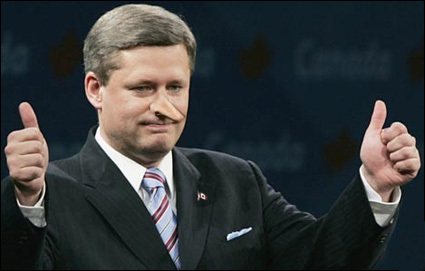 Let's face it, the photo's been applicable countless times since Stephen Harper became Prime Minister in 2006. But since a recent poll shows 40% of Canadians surveyed believe Senator Mike Duffys story while only 18% believe Steve-o's version (and 37% don't believe either of them), the picture seems especially apt at the moment. Happy Halloween, Steve-o! Can I suggest drowning your dirty politican woes in a tub of Mars bars this evening? And maybe find a mask that can cover up that telltale honker, at least for tonight.